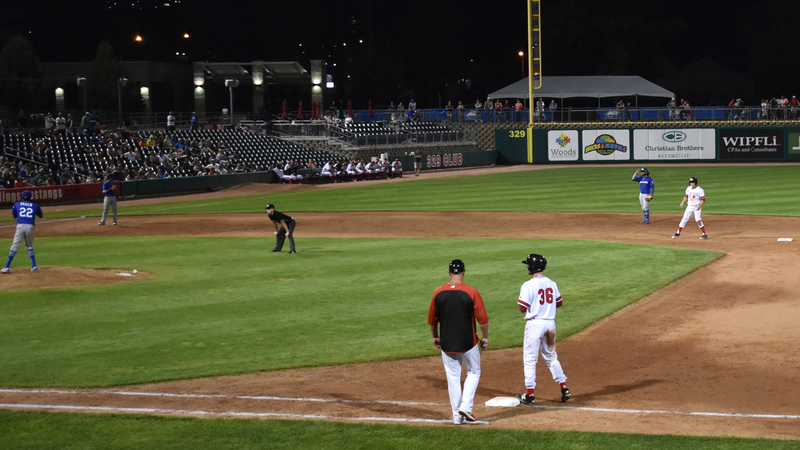 BILLINGS, MONTANA - The Billings Mustangs (12-2, 27-25) won their 3,000th game in team history on Saturday with a 6-5 walk-off victory over the Ogden Raptors (8-7, 34-19) in front of 2,138 at Dehler Park. The Mustangs found an early lead with runs in both the first and second innings. Zeek White hit the first of what would be four lead-off doubles in the game for the Mustangs in the first. He scored on the first of two errors in the game for the Raptors. They have now committed eight errors over the last three games. That lead was extended to 2-0 when Drew Mount led off with a double in the second and scored on a fielder's choice. Mount led the Billings offense with a 3-for-4 performance with a double, two runs scored and an RBI. The Raptors then nabbed their first lead with three runs on two hits and two walks in the third to knock Luis Alecis out of the game. Matt Cogen and Dillon Paulson hit back-to-back triples to give the Raptors a 3-2 advantage. Ogden gave themselves a two-run lead in the fourth after three consecutive two-out singles capped by the RBI hit of Jeffrey Souffront. Trailing 4-2 into the sixth, the Mustangs found a way to score four runs over the last four innings. Carlos Rivero's double followed by RBI singles from Mariel Bautista and Drew Mount helped bring in two runs in the sixth on three hits and tie the game. Bautista is now on a 10-game hitting streak, becoming the third Mustang this season to reach a 10-game streak. Both teams would hold a lead inside of the last three innings. The Raptors had a go-ahead run at third base in both the eighth and the ninth innings, but would strike out a combined four times between the two innings with a runner at third. In a 5-5 tie, the Mustangs came to the plate in the bottom of the ninth inning. Drew Mount singled to lead off and advanced to second on a grounder to the right side. Jay Schuyler was then intentionally walked to put men at first and second with one out and the winning run in scoring position. Juan Martinez singled on the first pitch of his at-bat to the right side of the infield that glanced off the glove of Ronny Brito. That allowed Drew Mount just enough time to advance two bases and score the winning run ahead of the throw home. The victory represents the Mustangs' 3,000th in team history and their fifth consecutive to match their longest winning streak of the year. They have won 14 of their last 16 and are two games above .500 in overall record for the first time this year. The Mustangs will look for the series sweep of the Ogden Raptors Sunday at Dehler Park. First pitch is set for 1:05 p.m.